This common tree of hedgerows, woods, chalk downs and waste ground, elder was once regarded as one of the most magically powerful of all plants. Elder has a great deal of human uses over history, mostly for food and drink. 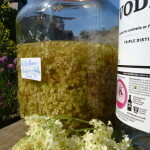 Elderflower cordial and ‘champagne’ is made from the flowers which can also be dipped in batter and fried as ‘fritters’. 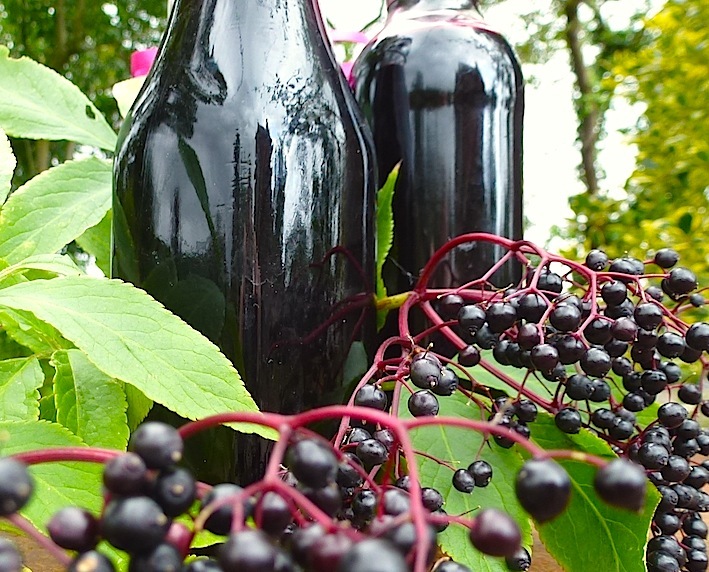 The berries are used to make rich wine. 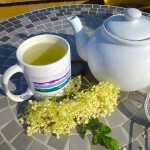 Elderflowers are also used to make a skin cleanser and eye lotion. There is also some reference to elder being used for a hedging plant. Please note that the berries, eaten raw, are poisonous. Suffering from summer allergies? 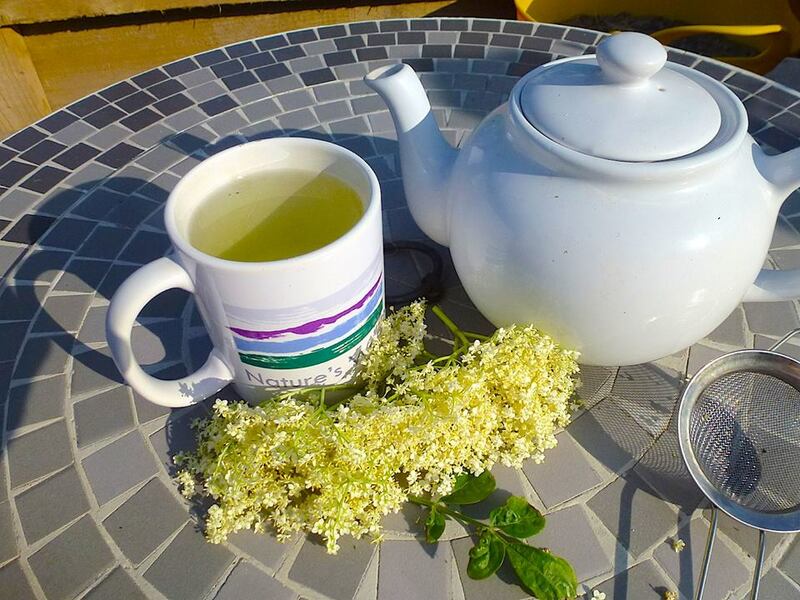 An infusion / tea made with Elder flowers is a great remedy for reducing hay-fever symptoms. I have suffered for years and collecting the flowers really sets me off sneezing so it is a relief to know it will help!! Pour boiling water over several flower heads and steep for 10 minutes. It is naturally sweet and can be used combined with other herbs like yarrow or add to green tea. 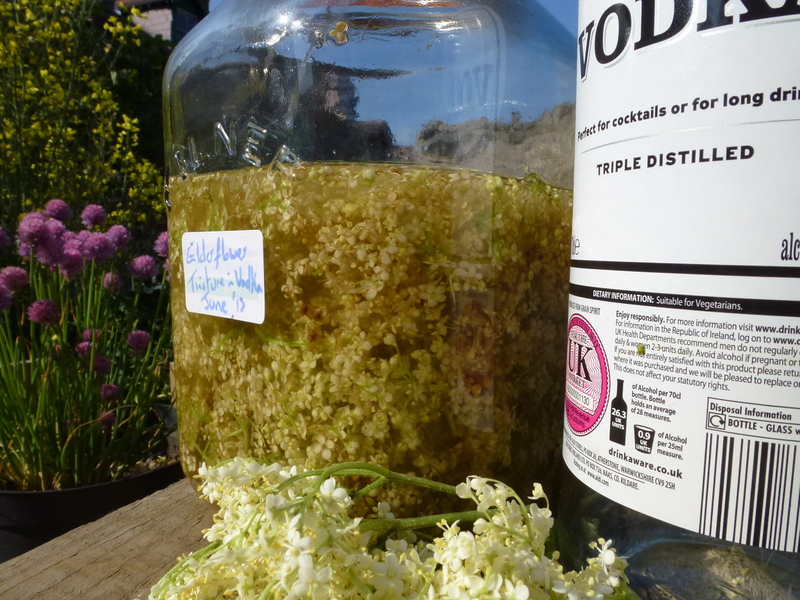 Continuing the elderflower theme I’m in the process of making a ‘tincture’ which will be ready in a few months. Plant constituents dissolve well in alcohol and vodka has no taste so is perfect! I’ve diluted the 40% vodka with water so it is 30% alcohol. 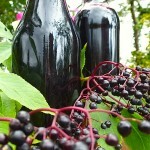 Prepare elderberries, I freeze them and then use a fork to remove the berries form the stalks. It is much less messy to do this when they are frozen! Add enough water to cover the berries in a pan. Boil for 30 mins, remove from heat and sieve. Then return to the pan adding the correct amount of sugar. Once this has dissolved add the ginger and cloves and boil hard for 10 mins. Then remove the cloves and ginger and either bottle the liquid or freeze in ice cube trays. The timber of elder is somewhat contradictory- the heartwood and rootstock is a beautiful wood that looks like ebony whilst branches are light and filled with pith. This hollow characteristic has been advantageous for some though as a perfect nature made pea shooter for children! It is also thought that the name elder comes the Anglo-saxon ‘aeld’ meaning fire because the hollow stems could be used to blow air into the centre of a fire like bellows. The leaves also had a use- it is said that a bunch of leaves will keep flies away from us or livestock due to their pungent smell. There are many and contradictory folklore and magical references to elder. It was thought that if you burned elder wood you would see the devil but if you planted one by your house it would keep the devil away. Elder’s habit of growing in disused areas, rubbish tips and cemeteries has also earned it veneration and distaste. In the middle ages it was also claimed to be the tree on which Judas hanged himself adding more layers of complexity to perceptions of the tree.